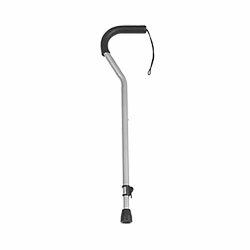 Cane Offset with Strap and Invacare Grip- Silver - Invacare canes offer a wide assortment of handgrip styles, including offset cane grips. In addition, we've introduced bold, exciting, consumer-preferred colors featuring our silver offset grip and strap cane. Limited Lifetime warranty.